Mr Benn was a character created by David McKee who appeared in several children’s books, and an animated television series of the same name transmitted by the BBC in 1971 and 1972. Mr Benn’s adventures always took a similar pattern. 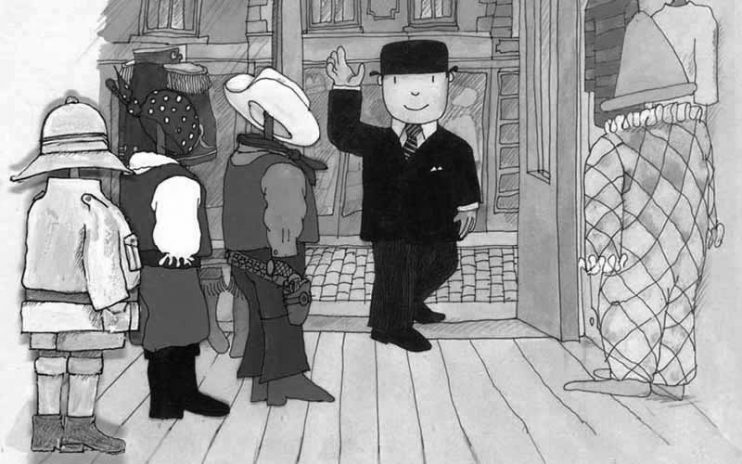 Mr Benn, a businessman wearing a black suit and bowler hat, leaves his house at 52 Festive Road and visits a fancy-dress costume shop where he is invited by the shopkeeper to try on a particular outfit. He leaves the shop through a magic door at the back of the changing room and enters a world appropriate to his costume, where he has an adventure (which usually contains a moral) before the shopkeeper reappears to lead him back to the changing room, and the story comes to an end. Mr Benn then returns to his normal life, but is left with a small souvenir of his magical adventure. Additionally, scenes before and after his adventure usually have some connection to it, such as the games the children are playing in the street as he passes. Only thirteen Mr Benn episodes were made but these episodes were repeated many times over the years, and many people retain fond memories of him. The episodes were narrated by Ray Brooks, and the music composed by Don Warren. 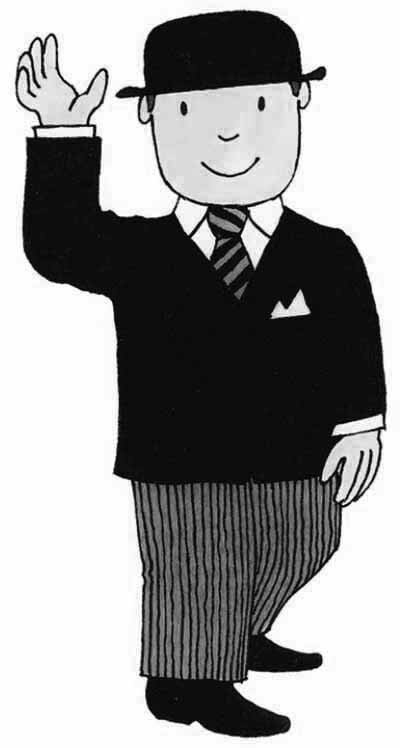 One episode which was in the Mr Benn books was not adapted for television because it was considered too controversial for children as it contained prisoners. The Hunter was also slightly altered; the book Big Game Benn features several hunters, but only one appears in the television episode. McKee did not benefit financially to the extent he might have; “I signed a contract where I only got a one-off payment and no repeat fees, but I’ve done quite well from a number of other things and I’m still exhibiting paintings.” Unfortunately, according to Mr Benn’s Little Book of Life, very little of McKee’s original artwork created for the television episodes exists today, as a majority of it was thrown into a rubbish skip in the 1970s. The series was voted the sixth most popular children’s television programme in the 2001 Channel 4 poll 100 Greatest Kids’ TV shows. It was also rated number 13 in the 50 Greatest Kids TV Shows which aired on Channel 5 in November 2013. McKee says he has always thought of Mr Benn as having the first name William. Following a pensioner. So far we have posted a letter in the postbox. Now we are going towards a SPAR shop. I am hoping for biscuits. Just fucked up a pigeon outside Greggs! Let this be a lesson to the rest of you mother fuckers! Your so aggressive much prefer pigeons. You need anger management!! The best has been yet to come for waaay too long. Friday night gym heads, the difference between who has a life. And who doesn’t cheers to working Saturday… Pfft. Shat on a man because his trousers are tucked into his socks. Very Sad News! Feral Pete just used the word Dench. He said SHE LOOKS A BIT LIKE THAT DAME JUDI DENCH. Yep. He meant Judy Finnigan. Mr Benn must have been the worst customer ever, he never bought anything from that costume shop. He was always too busy having little adventures in the changing room then he’s just give the Asian shopkeeper his costume back and go home. No wonder the shopkeeper always had an eye on him, I’d have banned him from the shop! Hey Ray, these are my childhood memories you’re sullying here!!! Gave 1000 Monkeys 1000 Typewriters. Wanted Shakespeare. Was a bit of a Fight. Yep. Have got 992 dead Monkeys and a copy of the Daily Mail. Just saw “Son of God”. The novel was better. Lumpy Space Princess is so annoying. Hi All! I know you haven’t heard from me in a long time. I hope you all are well. Mom and Dad have been dealing with some health issues and haven’t had much time to post. Layla and I are well and just playing around as always. Woof to you all! I am 20 years old and I cried at toy story three !!! Just sent you a selfie pout for the gallery haaaa!